In the right kitchen, an island can be an invaluable resource. 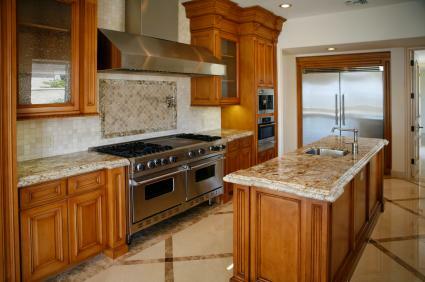 Kitchen islands have numerous uses that can help solve some common kitchen design problems. 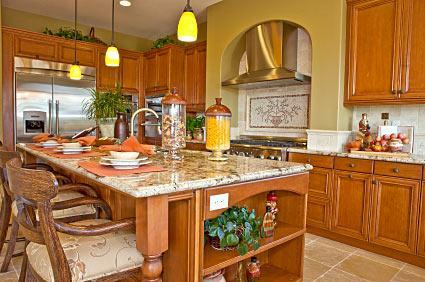 A kitchen island is a separate work station placed in the middle of the kitchen design. It can have several uses and configurations. Every kitchen design starts with the work triangle. This layout places your refrigerator, cooktop or stove and kitchen sink in a triangular layout that maximizes your kitchen's efficiency. For large kitchens, or open floor plan kitchens, sometimes a triangle is not possible without the use of an island. In this case, the kitchen island can be used to house the oven, stove or kitchen sink, shrinking the area between the tree workstations and making the kitchen more efficient. Keep in mind that if you do place an appliance in the island, you will need additional construction to run plumbing, electricity or a vent to the area. Additional building permits may be required for this work. If your kitchen wall space is limited, but your floor space is not, an island is a great way to add some extra storage to the kitchen design. Islands can be built with cabinets on one or all sides, or even left open with shelving beneath the counter for quick access. 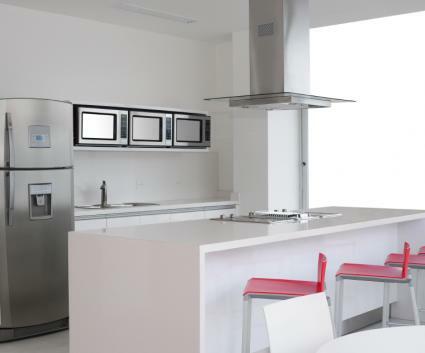 In order for a kitchen design to pass code, there must be specific amounts of counter space directly connected to, or with direct access to, the three main work areas, the refrigerator, stove and sink. If your counters are small or your oven or refrigerator is in a corner or unique area of the kitchen, consider installing an island right in front of it. This allows you to remove things from the oven or refrigerator and use the island as counter space, or a landing area, which can in turn help your kitchen pass code. If you want to add an island to your kitchen layout, keep in mind that to pass code, you need a specific amount of space all the way around the island. This is called the "pass through" zone and by law you need a minimum of 36-inches between two areas to walk through. Most kitchen designers will even aim for 42-inches to help make the room feel spacious. This means that your island cannot be installed less than 36-inches from your kitchen counters or any kitchen walls. This includes the countertop of both the island and the kitchen counters. 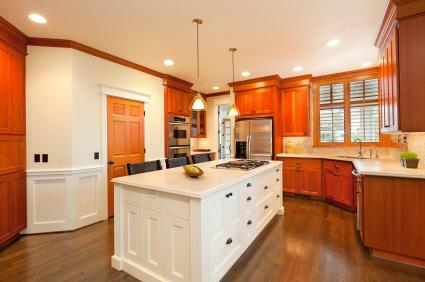 Counter overhangs on cabinets is typically 1/2- to 1-inch, but on an island can exceed 12-inches for seating, so plan the size of your island accordingly. Small islands and rolling islands do exist, but they may not give you the features you want, such as seating, an island sink or cooktop. If you plan on installing an island in your kitchen as a permanent fixture and not as a rolling island, you will be required to pass code, which means pulling a permit and having an inspection. If you choose to do the work yourself, rather than hiring a kitchen designer and contractor, make sure you find out from your town hall about any state or town specific codes, which may increase the distance you need around the island. Kitchen islands not only can enhance the use of your kitchen, they can also enhance the design or look of it. There are a few different directions you can go to add the island to your kitchen. For traditional and formal kitchens, having your island match the rest of the kitchen provides a unified and elegant look. This means using same cabinet style, cabinet stain and countertop material and color. Keep in mind if your island and cabinets are near one another, that you select counters for both from the same lot; granite, quartz and solid surface materials can all vary from piece to piece. Using the same lot will ensure there isn't any extreme variation that can detract from the design. If you choose to use a different color of the same material, make sure the two counters have at least one secondary or tertiary color in common. This may mean using a sedate granite on the cabinets and a wild, veined granite of the same color family on the island. This provides a cohesive look, even when the counters are different. The third option is to use a different color and style of cabinetry for the island and the cabinet runs. This look works well in Farmhouse, Tuscan, Country and Cottage style kitchens, because it gives you the option of adding a second color, stain or texture to the cabinets as well. For example, a kitchen with white or cream cabinets on the walls might be enhanced by a distressed, painted island in yellow or blue in the center of the room. The color on the island can be picked up in the backsplash tiles, the wall color or the drapes to unify the room and give it depth. Adding an island to your kitchen design can do a lot to enhance the look and use of the room. Plan its addition carefully to make sure you include everything you want, and nothing you don't.